Spice extracts are concentrated extracts that retain all the natural goodness and authentic taste of the herbs, fruits and flowers. Coriander seed is aromatic with a slight citrus flavour. It goes well with beef, lamb, chicken and game, root vegetables (carrots, potatoes) spinach, kale and is very versatile in cakes and biscuits. 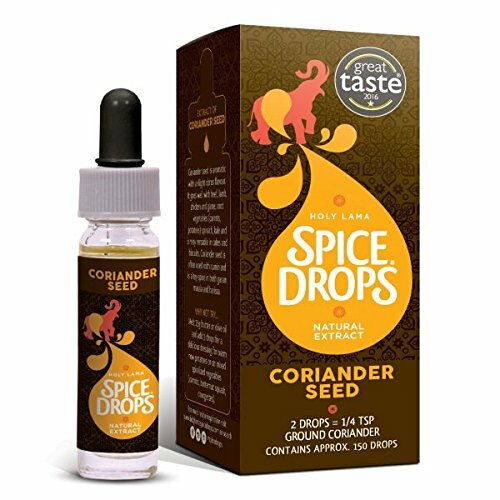 Coriander seed is often used with cumin and is a key spice in both gaRAM masala and harissa. Great taste award winner 2015. brand new international packaging. Concentrated extract of natural coriander in liquid form. Instantly adds spice and flavor to food or drink at any stage of cooking. Just a few drops go a long way! No artificial coloring, preservatives, or flavorings. Up to 3 years shelf life. If you have any questions about this product by Holy Lama, contact us by completing and submitting the form below. If you are looking for a specif part number, please include it with your message.